The charity arm of Binance is showcasing a blockchain solution to problems related to hunger and access to primary education. Find out how you can help here. 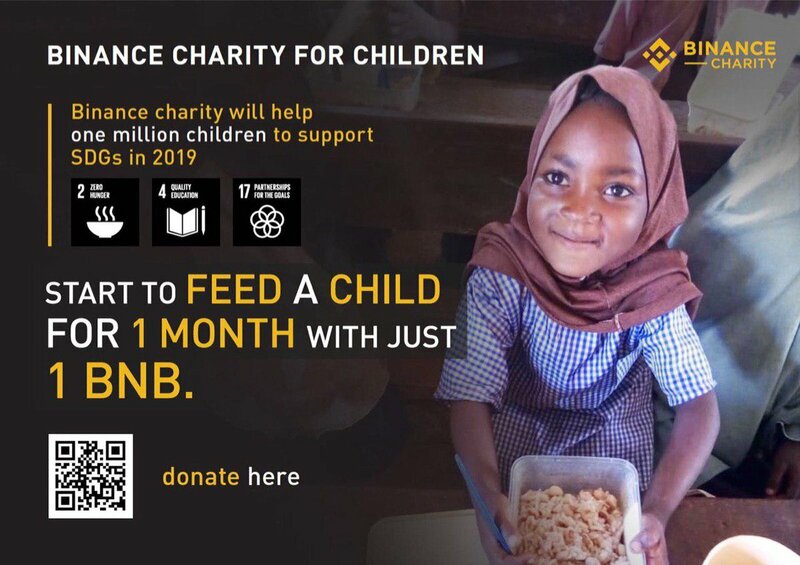 Your Binance Coin (BNB) can change the life of a hungry child. Binance Charity, the philanthropic arm of the cryptocurrency exchange Binance, has created Lunch for Children, a blockchain-enabled platform that will allow all Binancians to donate to our campaign to provide a lunch program for children in need. With this platform, you can feed a child in a remote area in Africa and other developing countries for a month. All it takes is 1 BNB. You can donate here. In fact, since Binance CEO Changpeng “CZ” Zhao announced the initiative durin Binance Blockchain Week, it has generated interest among attendees. For instance, James Radecki, the Global Business Development Head of Cumberland offered to match any donations made from the crowd during the event. Meanwhile, Mars Blockchain Group pledged to donate 20,000 Singapore dollars for the feeding initiative. Along with other donations and pledges made in the early hours of the announcement, we’ll be able to feed at least 2,275 children for a month, with more to come soon. We’re very thankful for our generous partners who help our cause. Hunger is the No. 1 health risk in the world — killing more people every year than AIDS, malaria, and tuberculosis combined. Around 3.1 million children under five years old die from poor nutrition each year in the world. One out of six children — roughly 100 million — in developing countries is underweight. 66 million primary school-age children are attending classes without enough food supplied across the developing world, with 23 million in Africa alone. In East African countries such as Kenya, Uganda, and Tanzania, a child only needs $0.30 a day to have breakfast and lunch that provide enough nutrition and energy to them. However, the daily income of most people who live in impoverished areas is less than $1. This means they cannot afford sufficient food for their children, especially when the parents have more than one child. Without getting enough food, children do not want to go to school. Instead, they are hired as child laborers to earn a little money to buy some food to survive. The hungry children should have a healthy and happy childhood and a warm and supportive environment to grow in. 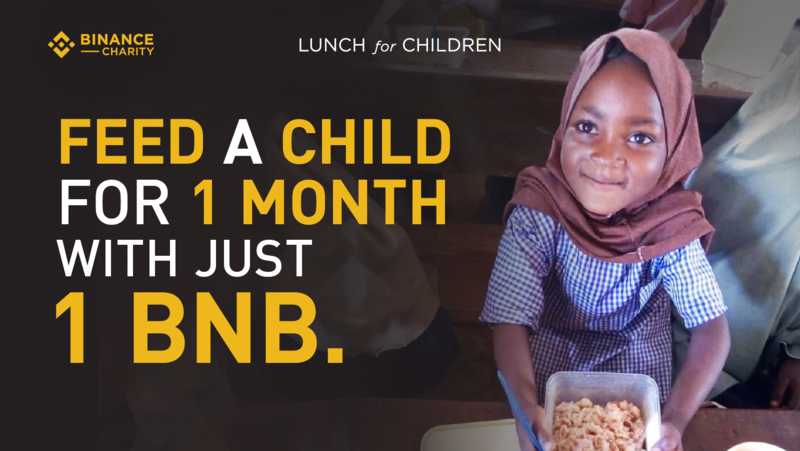 We now have the chance to change their lives, with the Binance Charity’s Lunch for Children campaign. The Lunch for Children campaign is considered to be a proven sustainable solution benefiting households, schools, and communities in various places in Africa. This solution is being adopted in six nations in Africa, such as Uganda and Nigeria. The underserved demand for feeding children in various areas in need is now being met via Binance Charity’s intervention, in partnership with other notable donors. Zcoin, a company dedicated to providing privacy on the blockchain, and DBSA, (Dream Building Service Association), the NGO that started the “Lunch for Children” campaign. What makes Binance Charity’s Lunch for Children campaign unique is that it combines blockchain with feeding programs for children to ensure full transparency regarding how many children are being fed with each donation. This campaign will kick off in February 2019, starting with Jolly Mercy Learning Centre in Kampala, Uganda, which has been selected as the pilot school for the program. in collaboration with various schools and international NGOs across Africa, Binance Charity aspires to support more than 50,000 students in Africa with food paid for in cryptocurrency form, by disbursing the crypto donation directly to the children’s individual crypto wallets, which will be handled by their legal guardians. The Zcoin team and its seed investors pledged Bitcoin worth estimated USD $24,000 to support the roughly 340 students and school staff in the Jolly Mercy Learning Center for the breakfast and lunch for one year, comprising of three semesters. Binance Charity and DBSA will select schools that serve poor children and choose reliable food suppliers that provide healthy food for children at a competitive price. The donation will first go to the crypto wallets of children’s parents or legal guardians, who will then send crypto to suppliers’ wallet to redeem for their children’s food. Everything will be on the chain and can be verified by everyone. This application of blockchain technology on charity serves as a critical tool to guarantee the transparency, accountability, and efficiency of all transactions and eliminate potential fraud and corruption in between. This project has triggered immense interest from youth communities in China since it launched. Some Chinese volunteers who are 18 to 25 years old are already on board to provide facilitation including computer skills, blockchain and cryptocurrency knowledge transfer, and on-site monitoring the usage of fund and lunch distribution. The Binance Charity plans to expand the Lunch for Children campaign to surrounding countries, including Ethiopia, Kenya, and more. The campaign is now open for applications from any interested volunteers worldwide who dedicated themselves to the blockchain for children and social good. The fundraising channel for Lunch for Children is now open for donations; please visit https://www.binance.charity/projectDetail/5. This donation channel is for the benefit of the victims of the Bukalasi Sub-county Landslide Disaster in Uganda. This donation channel is for supporting various charity endeavors of Binance Charity, including upcoming ones. For more information and volunteer-related consultation, please contact bcf@binance.charity.